FT. LAUDERDALE-DAVIE, Fla. – Nova Southeastern University’s (NSU) College of Optometry recently held its Silver Anniversary celebration at NSU’s Alvin Sherman Library, coinciding with NSU’s 50th anniversary. 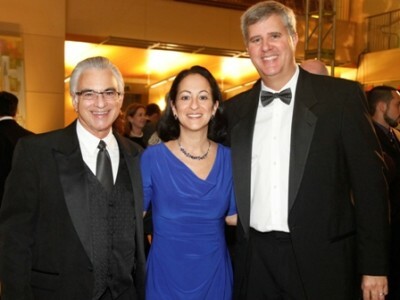 Nearly 300 guests, including philanthropists, alumni, administrators, faculty and staff joined together to celebrate 25 years of education, scholarship and service. Upon arrival, the guests were greeted by a winged performer and an aerialist as they stepped onto the red carpet to have their photographs taken. Aerial drummers astonished attendees as they put on a brilliant performance, dangling 30 ft. in the air. Guests enjoyed musical entertainment by a jazz fusion band, which performed throughout the evening, and a harpist, who serenaded attendees in the second floor gallery. Samplings of exquisite culinary treats were provided at various stations, including a carving station, a seafood martini station, a sushi station, and much more. Throughout the evening, speakers reflected on the college’s accomplishments and successes. 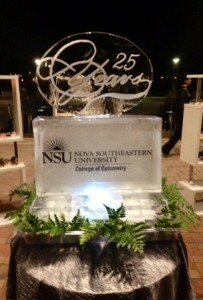 NSU’s College of Optometry opened its doors 1989 as part of Southeastern College of Health Care Sciences as the only college of optometry in Florida. Today, it remains the only one in the state and one of only 21 in the United States. Students study the most advanced techniques from world-renowned faculty members while caring for South Florida’s culturally diverse patient population. More than 32,000 patients visit NSU’s Eye Care Institute’s facilities in Davie, Fort Lauderdale, and North Miami Beach (along with Broward Lighthouse in Fort Lauderdale and Kids In Distress’ Wilton Manors campus) annually. The institute is Florida’s largest and most comprehensive optometric center. The Institute’s services include primary eye care and specialized services for pediatrics and binocular vision disorders, low vision rehabilitation, advanced contact lens fits, management of macular degeneration, diabetic retinopathy, and glaucoma, as well as electro-diagnostic testing. The college has continued its innovative path, offering the only five-year extended optometry and one-year preparatory optometry programs in the United States. The program also offers a dual M.B.A. program to help students prepare for their careers and the only online Master of Science degree in Clinical Vision Research in the United States. For more information on NSU’s College of Optometry, please visit www.nova.edu/optometry. About Nova Southeastern University: Situated on 314 beautiful acres in Ft. Lauderdale, Florida, Nova Southeastern University (NSU) is a dynamic research institution dedicated to providing high-quality educational programs at all levels. NSU is a not-for-profit independent institution with 27,000 students. NSU awards associate’s, bachelor’s, master’s, specialist, doctoral and first-professional degrees in a wide range of fields. NSU is classified as a research university with “high research activity” by the Carnegie Foundation for the Advancement of Teaching, and it is one of only 37 universities nationwide to also be awarded Carnegie’s Community Engagement Classification. For more information, please visit www.nova.edu. Celebrating 50 years of academic excellence!